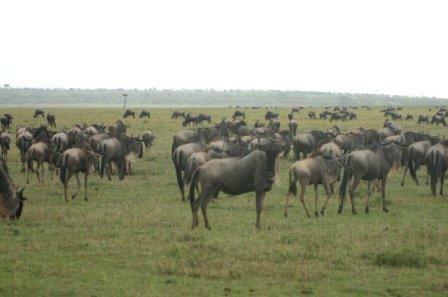 The Great Wildebeest Migration is one of the greatest wildlife spectacles on earth. 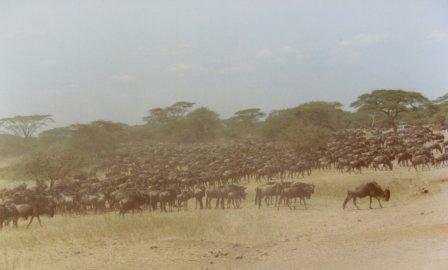 It involves close to one and half million wildebeest and their migration partners, zebra and gazelles. 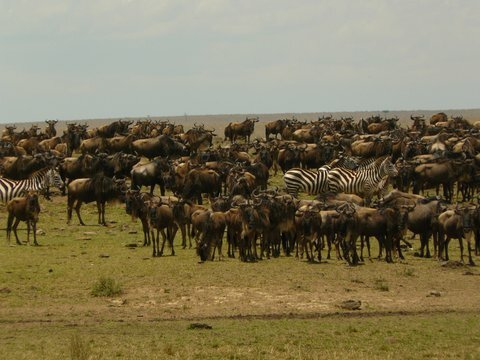 The migration covers a distance of 1000 km annually, from the Serengeti National Park in northern Tanzania to the Masai Mara Game Reserve in Southern Kenya. 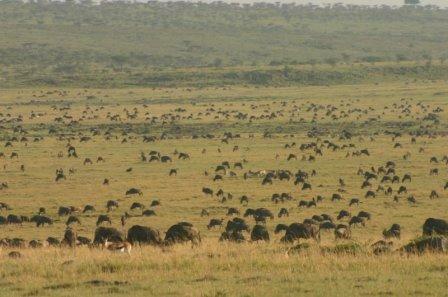 In March and April, there is plenty of grass in the Southern Serengeti. 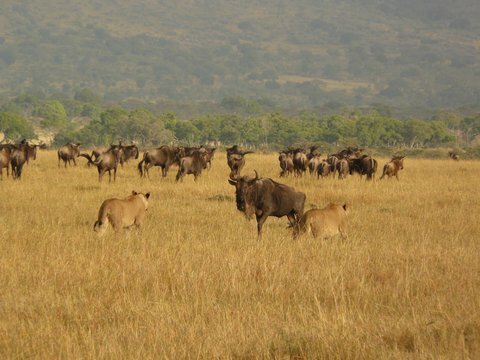 By the end of May, which is the mating season for the wildebeest, the dry season creeps in and the grass dries. 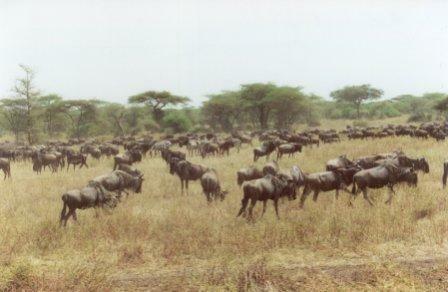 The migration moves to the Western Serengeti in search of green pastures. 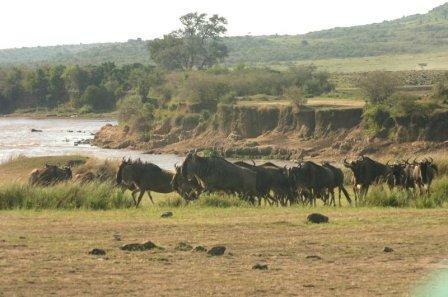 By July, the migration crosses the Mara River to the fresh sweet grasses in the Mara Reserve. 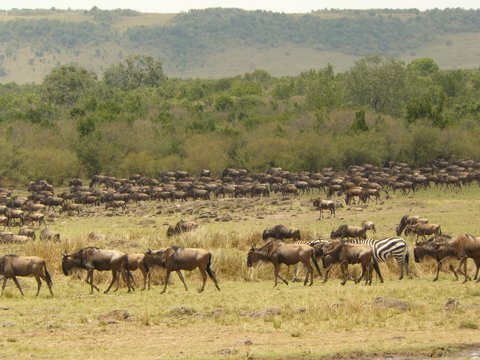 In October, the migration starts its return trek to the Serengeti. 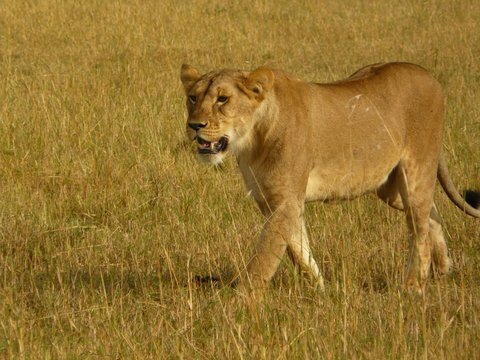 The Serengeti National Park / Ngorongoro Conservation Area is arguably the most impressive wildlife sanctuary in the world. 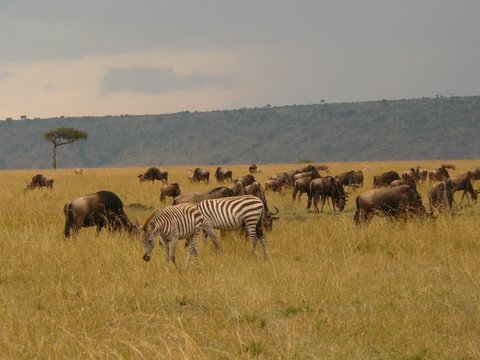 During the months December through March the seemingly unending plains of the southern Serengeti and the Conservation Area are inhabited by enormous herds of wildebeest and zebra. The great herds graze on rain ripened grass. 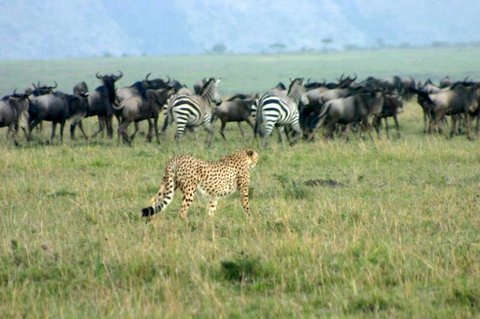 In the calving season (late January through mid March) the herds concentrate at the Ndutu and Salei plains (Southern Serengeti / Ngorongoro Conservation Area) attracting the attention of predators like lion, cheetah and hyena. During the months April and May the depleted plains are unable to sustain the endless herds. 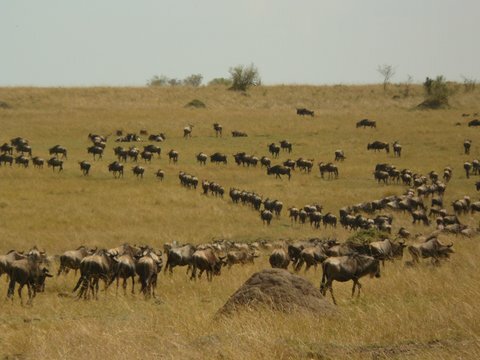 The migration, sweeping west and north, moves from the short grass plains of the southern Serengeti / Ngorongoro Conservation Area to the long grass plains and woodland of the Serengeti’s western Corridor, almost to Lake Victoria. This period is during the long rains and is considered off season for wildlife viewing in east Africa as roads are often impassable. 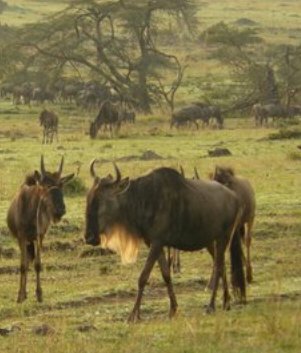 By the end of May the wildebeest have exhausted the Western Corridor’s best pastures and the herds must move further north. 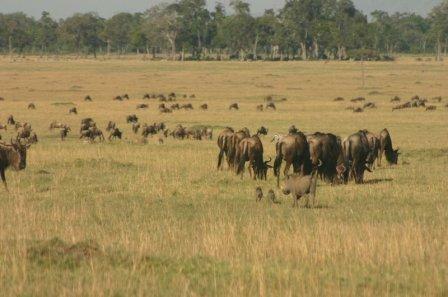 Entering the Lamai Wedge and the Mara Triangle breeding occurs May through June. This is a transitional period between the rains and the dry season. 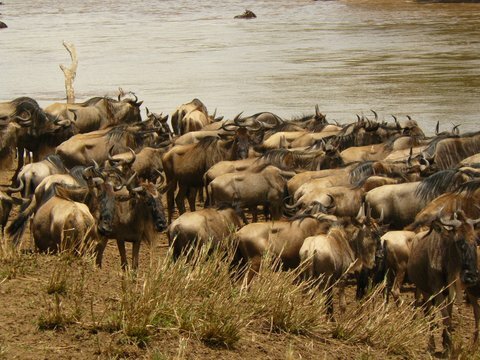 By July the countless herds have amassed along the swollen Mara River – a final barrier from the short sweet grasses of the Masai Mara. Sometimes the crossing place they have chosen is shallow allowing the majority of animals to pass safely. 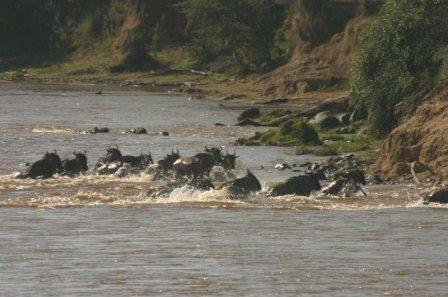 In other areas the waters boil with drowning wildebeest and slashing crocodiles. 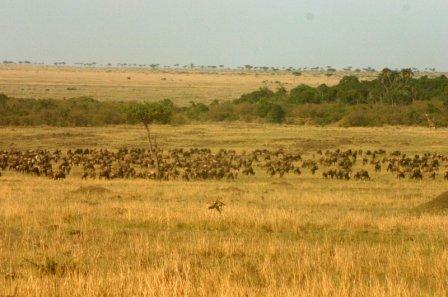 Between July and October the wildebeest reside in the Mara. 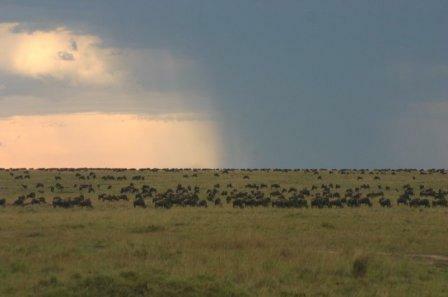 The arrival of the short rains call the migration southward. As November ends the migration is making its way back to the southern Serengeti and early in the year they once again give birth. The circle of life is complete. 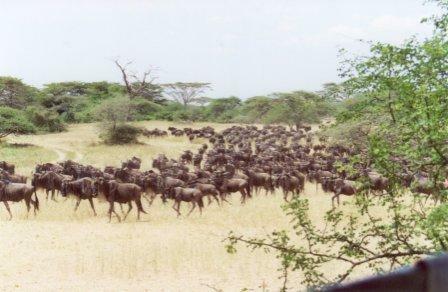 The migration is a natural event and the timing varies month by month; year by year.